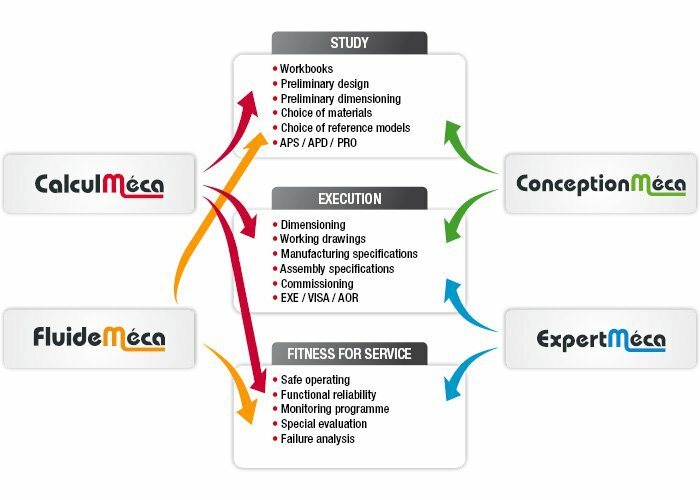 The cluster is formed by Calcul-Meca, Conception-Meca, Expert-Meca, Fluide-Meca and Formation-Meca and offers complementary skills in mechanical analysis. Our aim: Spearhead the behaviour of materials and structures in order to ensure the technical and economic feasibility of constructions and the safety of people and property. The cluster is the link between the theory and our clients’ expectations. We are like an interface between research and development institutes, university laboratories and technical centres, and the clients, architectural firms, builders, operators, insurers and legal experts. We stand by you in achieving your projects; from study to technical expertise under operating conditions, including the stages of design, dimensioning, manufacture, assembly, monitoring and maintenance.